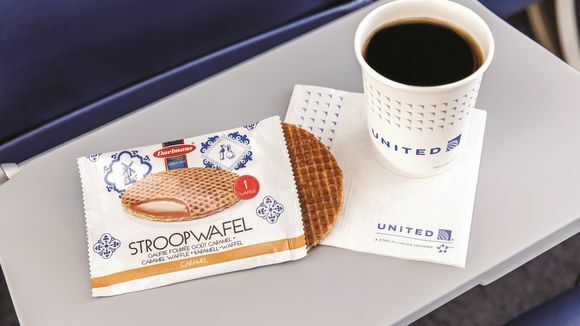 Free snacks are back on United Airlines beginning today, with thousands of customers enjoying the scent of cinnamon and caramel this morning as they indulge in complimentary stroopwafels – Dutch-made toasted waffle treats. Later today, the airline will offer an Asian-style snack mix of rice crackers, sesame sticks and wasabi peas, or a zesty ranch mix of mini pretzel sticks, Cajun corn sticks and ranch soy nuts. United is serving up the complimentary snacks to economy-cabin customers on flights within North America, to and from Central America and between Honolulu and Guam. Stroopwafels, available on flights before 9:45 a.m., may be enjoyed straight out of the package or warmed on top of a cup of coffee or tea to soften the waffle and melt the caramel filling. The packaged snack mixes will be available on flights departing at 9:45 a.m. or later. United will continue to offer Choice Menu items for purchase or complimentary economy-cabin meals, depending on length of flight and location. The airline will introduce illycaffe’s scuro dark roast this summer on flights worldwide.